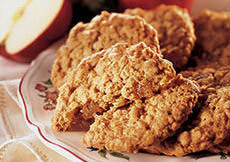 Our best-selling bakery delight! Miles apart from traditional fruitcake, our Fruitbread is packed with juicy dried fruits and crunchy nuts in a moist applesauce batter. Available in a beautiful gift tin or loaf pan. Gift wrap not available for the Loaf Pan. INGREDIENTS: sugar, enriched flour (wheat flour, niacin, iron, thiamine mononitrate, riboflavin, folic acid), apples, dried apricots*, dried pears*, walnuts, butter (pasteurized cream, salt), eggs, hazelnuts, dried cranberries, dried cherries, cinnamon, modified food starch, baking powder, baking soda, salt, lemon peel, potassium sorbate, sodium benzoate, citric acid, sodium citrate, high fructose corn syrup, lemon juice concentrate, sunflower oil, sodium benzoate and potassium sorbate (preservatives). ALLERGEN INFORMATION: Contains milk. Manufactured on equipment used for processing peanuts, tree nuts, seeds, and soy. 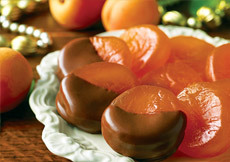 *Dried apricots and pears contain sulfur dioxide, a preservative. This has become a standard for our Christmas season. Just the right moistness, fruit and nuts; DELICIOUS! The fruitbread...incredible. Sadly, also incredibly caloric, but each bite is worth it, my friends, worth it! 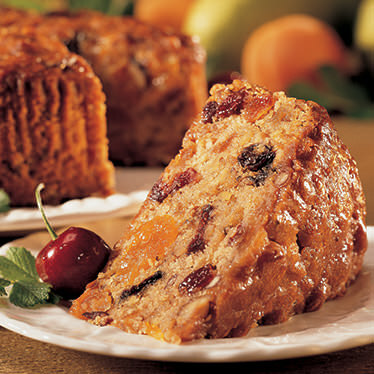 I can't even describe it, it's moist, nutty, fruity and believe me, it is nothing like "fruitcake." Everyone who tries it will be begging for more, even those die-hard chocoholics.